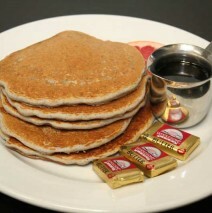 Stack of 5 Blue Corn Pinon Pancakes served with butter and pancake syrup. Native American , Spanish and Anglo cultures inspire this blend of culinary heritages. A mix of blue corn, wheat, soy and oat flours with NM pine nuts.